Sorry I didn't post last week. I guess I got lazy and time slipped away from me. Nothing really happened though. 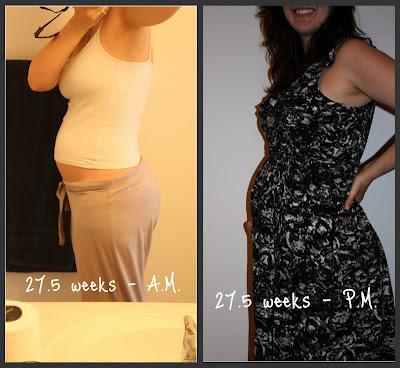 Here is my 27 week belly picture. I wake up in the mornings and my belly is small. Not much at all. Definitely not a woman less than 10 weeks away from being full-term. Then, after I eat my first meal, it pooches out. It gets increasingly poochier throughout the day until, at the end of the night, I look extremely pregnant. You can see below the difference 12 hours makes. I think it looks totally different. There is a real bulge up near my ribs. I guess the dress wasn't the ideal outfit for this experiment. You know you have a belly when..... your belly hits the skillet you are cooking with on the stove and you wind up with a burn the size and shape of a quarter on your bump. Now I'm paranoid he's gonna come out with a birthmark and I will forever think it was burn damage. I have officially hit my third trimester!!!!! Baby is still the size of the eggplant through these last two weeks and through next week. He is over one foot long and probably over two pounds by now. He's already got that cute, pink glow! His eyes are formed and he's practicing blinking! He gets the hiccups all the time. I also think he is starting to run out of room. He went through a phase where he was active and swimming all day long. I'd feel bumps every few seconds here and there non-stop. Now, his movements are more of a wave that travels across my stomach as he rolls and each 'kick' I feel throughout my entire ute. My ute is supposedly over 12 inches tall now. His movements, best as I can describe them, feel like a bubble that fills that 1ft space pops suddenly. I feel it on all sides. Braxton Hicks are still going strong. I get one every time I get up to pee in the night or following any sudden movement. If baby were born today, he would have an 85% chance or better of surviving! movement? Tons...right now in fact. I'm double dutying (word?). Typing this and catching little bits of movement on video. He kicked tons on our first try!! He's a show off! food cravings? still tons of tomatoes. I have really only craved anything/everything fresh like strawberries, grapes, tomatoes, celery, etc. I guess that is why she had to put me on this high-fat diet. I wasn't eating enough....though I've been eating more food a day than I ever have pre-preg. Now I'm getting to the point where I am wanting anything anybody mentions. We were at Red Lobster for our anniversary dinner last night and the table behind us was talking about Bob Evans sausage. I found myself wanting that more than the incredible meal being cooked for me. Gggrrr. 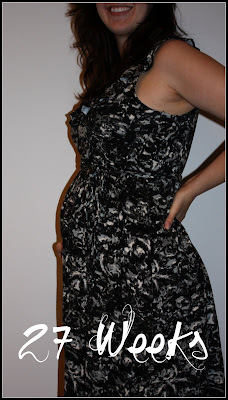 Another prego blogger called it the "see food diet" but its really more of a 'hear food diet'. I hear it and I want it. Crazy! Greg is having fun with this phase. belly button- in our out? it is definitely on its way out. It was always a deep innie but now there is part of it that definitely sticks out. Gross. maternity clothes? when I go anywhere I usually throw on a maternity top because I still think that I just look bloated most of the day. It makes it more obvious. In the afternoons/evenings I def look preg (see above). I'm still wearing my normal jeans with the be-band holding them up. I can still get them zipped a little bit. And DEFINITELY the maternity bras. No doubt about that.